Last April all the left and far-left groups in Venezuela and everywhere else tried to outdo each other in loudly proclaiming: “the working class has triumphed in Sidor!”. Chavez had just announced the nationalization or rather the re-nationalization of the largest iron and steel company in the country (and the region), and fourth largest in Latin America. The Sidor company which had been created to provide the national oil industry with pipes, was privatized in 1997; it came under the control of Ternium-Techint, an Italo-Argentinian consortium which bought 60% of the stock. Techint was founded in Argentina after World War II by the Italian steel magnate Agostino Rocca. Supported by Mussolini, Rocca had been entrusted with the direction of the State iron and steel industries, the post of Secretary of the Metallurgical War Industries in 1933, etc. But the prospect of a German defeat brought him, like other Italian bourgeois, to distance himself from the regime of Mussolini from 1943 and to contact the pro-American resistance. Held by administrative decree at the time of the legal purges until liberation, he could thus be quickly released; however he judged it more prudent to go to Argentina to establish enterprises, while the family group thrived in an Italy in full reconstruction. Techint became the largest industrial group in Argentina, producing steel and oil; Argentinian political leaders can refuse it nothing, as shown by the declarations of support by president Kirchner which were used to obtain a “fair price” from Chavez. Above all, out of 13,500 workers, now no more than 4500 have permanent jobs and are employed directly by the company, the other 9000 being “outsourced” (tercerizados) i.e. employed by sub-contracting companies with only temporary contracts and at lower wages. Ultimately the workers of Sidor experienced a strong deterioration of their conditions, which is well below those of workers at other large firms in the area. In 2007 during the renewal of the collective agreement of the permanent workers, the trade union SUTISS proposed the demand of an increase of 300% in wages (that is to say an increase of 80 Bolivars in the hourly wage) to recover the losses undergone by the workers, as well as other socio-economic claims, and the extension of the collective agreement to the outsourced workers. The negotiations dragged on for… 17 months, 17 months during which the trade union did all that it could to prevent a real fight by the workers, instead organizing partial and temporary strikes, demonstrations/marches, etc, and especially to call for the intervention of the government and to demand nationalization of Sidor. Meanwhile it had reduced its wage demands to 53 Bolivars; the company directors proposed 45 and had agreed to reinstate 600 outsourced workers. At the beginning of year the government sent its Minister for Labour, the “trotskyist” Jose Ramon Rivero, who had managed to resolve the social conflict at the PDVSA. However in Sidor neither democratic demagogy (organization of a referendum among the employees), nor the threats of Rivero, nor the use of the National Guard against the strikers, succeeded in resolving the conflict, i.e. to calm the workers down; on several occasions they went well beyond what the trade unions counselled by launching spontaneous strike movements, while solidarity movements encountered a growing echo in the other companies in the area. It is in this situation of increasing tension that the government suddenly announced the nationalization of the company in April . Orlando Chirino, national organizer of the UNT union federation and a leader in its C-CURA (Current-Classist, United, Revolutionary Autonomous) current made the following statement, expressing the opinion of the whole political and trade union spectrum of the Venezuelan left and far-left: “Undoubtedly the nationalization of Sidor (...) is the result of the struggle and the mobilization led by the workers for over a year and a half. It is an indisputable triumph of workers and an example for the whole Venezuelan working class”. Chririno added: “The vanquished are the multinational Ternium and the government of president Chavez himself which until last week supported the company, through the attitude of the Minister of Labour. (...) The change of attitude of the government, and its announcement of the beginning of a still indefinite process of nationalization, is a categorical triumph of the workers’ strikes and trade-union autonomy” (1). After the loud declarations of victory from all sides, it is understandable that the workers of Sidor reacted with glee to this announcement. We published an official statement to explain that, nationalized or not, Sidor remained in the hands of the exploiters and that the proletarians could count only on their own struggle to obtain satisfaction for their demands (2). There we explained: “This nationalization, not even an expropriation, paid down to the last Bolivar, signifies the policy and the nature of the current government in Venezuela; it indicates to us that we are in the presence of a traditional bourgeois government which has a resultant horror of attacking private property. It was not necessary to wait for a long time for the reality to emerge from the euphoria abundantly diffused by all the false “workers’” and “revolutionary” organizations and currents.. In spite of all the beautiful rhetoric about the new “socialist enterprise” that Sidor was going to become, the contract finally signed on May 6 in the presidential palace between the factory directors and SUTISS (the steelworkers union) in the presence of Chavez, was far removed from the demands for which the workers had mobilized themselves for months: 53 Bolivars increase, but only 33 with the signature of the agreement, 10 more in November and 10 more the next year; since there is galloping inflation in the country which will rapidly corrode the future increases envisaged, this means that the trade union lowered its demands still further when compared to what it demanded before the nationalization! A merit premium of 10% has also been obtained along with revolorized holday pay. The news of the concluding of this agreement stupified the “outsourced” workers. On May 7 they decided to occupy the trade-union local hall to try to get an answer to their questions: why had the trade union given up a whole series of demands, how would the reinstated workers be selected , in short, what was going to be their fate? The occupation took place again the following day, but in the reigning climate of uncertainty, the trade union leaders succeeded in demobilizing them while saying that the negotiations would continue to develop and that all the problems could not be solved at one blow. On May 12, at the time of a signing ceremony of the law on the nationalization of Sidor and signing of the new labor contract Chavez made the same speech, alternating threats and promises. Now, he said, the workers must exhibit “a new behavior”, where conflict gives way to “a relation of affection and collaboration, where fraternal differences must lead to agreements, like brothers and comrades, because all must take care of the interests of the fatherland, of the revolution, so that we build socialism with Sidor”. As for the “outsourced” he ensured that he had their fate at heart, he declared: “do not despair, do not come to ask me to have in one day what you did not obtain in 10 years”; but “that does not go for the manipulators among you, because I will denounce them (...). I do not accept manipulation nor blackmail [and, you] the workers’ leaders, be careful you do not get carried away by trade unionism” [obviously, what he was really saying was to be careful not to defend the workers’ interests too much]. He added: “anyone who comes to ask me out of the blue to sign for the reintegration of from 5 to 10,000 workers is insane”, eliciting, according to the press, the applause of those in attendance; according to him the request for reinstatement of all the workers forming part of the “counter-revolutionariy attitudes” which exist in Sidor. He finished off by calling for “the union of the working class, the Armed Forces, the peasants, the students, of all the Venezuelans, so that in spite of differences, we have the maturity to put above private interests, the general interest which is the Bolivarian Revolution” (3). In addition to being the classic appeal of all bourgeois to the proletarians so that they sacrifice their class interests to a supposed general interest which is never anything other than the capitalist interest, we can see that Chavez thoroughly utilizes the hoary reformist demagogy according to which nationalization = socialism to demand that the workers give up their demands and the struggle, threatening that those who do not comply, are to be fought as manipulators and counter-revolutionaries: the nationalization of Sidor is above all a weapon against the workers! Since then, negotiations with Techint are continuing. The nationalization is actually a share buyback sufficient to ensure that the Venezuelan State has an absolute majority of the shares, given that the government wants to leave a minority interest and a directors position to the Argentinian shareholder to ensure that it continues its activities in the country. Techint stipulates a price no lower than 2.4 billion dollars for 50% of the shares; on July 15 Chavez, who said he wanted to negotiate by amicable agreement, declared that a basic agreement on price had been reached; according to the Venezuelan press it would be 2 billion dollars, and in addition the free delivery of products. On June 11 Chavez and his principal ministers brought together 500 of the most important owners in the country in a luxurious hotel in the capital. At the conclusion of this meeting which was billed as a “productive revival”, a whole series of measures favorable to the companies were announced; the objective was to make Venezuela a “middle power” through a grand “National Strategic Alliance” with the national capitalists. While the government thus smiles and makes resounding and staggering offers to the capitalists all the while talking about revolution, the workers continue to be exploited as always – by the same capitalists and their confreres! We saw in the first part of this article last spring that all the left and Chavist groups unanimously welcomed the government decision to renationalise SIDOR steel company (4) as a great victory for workers. But not all the workers were convinced, and certainly not the 8,000 “outsourced” (tercerizados) who had experienced a decline in wages and the loss of a whole series of benefits and loss of their status as employees of the company as a result of privatization. Demanding their reinstatement, they have maintained their mobilization for months; in late October, following the arrival of Minister (of Basic Industries and Mining) Sanz (who has somehowbecome a sort of honorary director of the company), it escalated into a blockade of entry points into the company, cutting off of the main state highway, the burning in effigy of shirts with Chavez’s image on them, and soon. The negotiations having yielded nothing, the organization representing them resigned itself to call a strike on November 11; very well supported, it caused a serious decline in production and after 2 days an agreement with Sidor was concluded under the authority of the Minister. The agreement basically paying a premium of 10,000 Bf (to be paid in several installments) and improvements in working conditions, it should be noted that union representatives had agreed in the spring to Chavez’s demand that they be «patient» on the issue of reinstatement – ie to in fact abandon this demand. But since November close to 2,000 workers still have not touched a penny of the promised bonus, while the others still are waiting for the realization of other promises! In the face of the workers’ exasperation, the union was forced to give the impression of doing something; it organized the sending of delegations to the Ministry in Caracas and then appealed to Chavez. While the management of Sidor reacted by treating the most militant workers as “delinquents”, the minister-director accused them of being manipulated and drawn into “political” actions. The elements and currents who, all the while falsely presenting the nationalization of Sidor as a great victory for workers, were keen to distinguish themselves by appearing a little more left, called for “nationalization under workers’ control.” Behind this slogan from Trotskyism there is nothing more than demagoguery and camouflage in order to support government policy. We will consider the case of the Trotskyist group “Opcion Obrera” (Workers’ Option), linked to the argentine Workers Party (6), which appeared to distinguish itself from other more or less pro-Chavist far left formations. O.O.has indeed had the merit of pointing out the “trap” of “capitalist nationalization” (what exactly would signify a non-capitalist nationalization?) of Sidor, correctly explaining that it would serve to extinguish the workers struggle. But the fundamentally tailist and manoeuverist nature of Trotskyism rapidly returns to the scene. In O.O.’s document on Sidor, there are criticisms of the union (SUTISS), especially because it refuses to call for the unlimited strike, but it reads as an analysis in which the main issue of conflict at Sidor, is the right of unions to strike: “A union which cannot strike is not a union, it is a state drug dispensary. 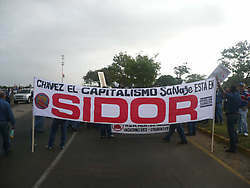 The conflict in Sidor is a battle in the war being waged by the Chavist government to statify the unions, to put them under the direct tuteledge of the government and install a bureaucracy under its orders, ie to liquidate them as organizations of the working class to defend its working conditions. If the union leadership gives in to the government pressure and accepts arbitration, it will turn into a transmission belt of the ‘Bolivarian’ State against the workers” (7). In fact, the union bureaucracy of SUTISS didn’t have to wait for government pressure in order to prevent any real struggle, to the extent that Chavez was able to remind it that it had accepted deteriorating living and working conditions and the outsourcing of thousands of workers at the time of the preceding privatization of the company! These collaborationist unions have as their primary function the maintenance of social peace and not the defense of proletarian interests. When they come into conflict with the government, as did the CTV union in the oil sector, it is not because they are “organizations of the working class”, but because they are tied to sectors of the bourgeois opposition. O.O.. wants to “democratize” these unions, by supporting some currents in the bureaucracy which call themselves “classist” because it occurs to them to criticize the government sometimes... in the name of the “Bolivarian Revolution”! In fact, from a class point of view there is nothing to defend in the trade union apparatus, on the contrary, it is independent from them and against their practice of class collaboration, against their ties to the owners or the State, that the proletariat must organize on a really classist basis to fight against the bosses, private or State. This so-called “socialism”, which does not aim to destroy capitalism but to industrialize the country and defines its program based on national interests, certainly contains nothing socialist: it is just as bourgeois as the “Bolivarian socialism” of Chavez! The real political role of the proletariat begins with its organization into a class and consequently into a party, as specified in the Communist Manifesto. If the objective of each proletariat is to seize power and destroy capitalism in its own country, its goals are not national but international, if it is impossible for it to establish socialism in one country it has even less the function of industrialization and development of each country before making the revolution and destroying capitalism! It is only after the overthrow of the bourgeoisie and the establishment of its dictatorship, that the proletariat will be able to begin to transform the country economically and socially, and it is only after the international victory of the Communist revolution that it will be able to elaborate a unified global plan to solve problems of inequality social and economic development throughout the world (including over-development of certain areas ravaged by industrialization). The slogan of “workers’ control” first appeared during the revolution in Russia, in a situation of “dual power”, where the workers had created the “Soviets”, which constituted an embryonic proletarian power opposed to bourgeois power. Lenin in April of 1917 advanced as an immediate objective “the passage to the control of social production and the distribution of products by the Soviets of Workers Deputies”, this is inextricably linked to the demand that all power pass to the Soviets. In late May, in a resolution for the Conference of Factory Committees of Petrograd, it puts forward, among other things, the demand for a “real workers’ control of production and distribution”. But Lenin is at pains to state that the implementation of all measures of this resolution “is only possible if power passes entirely into the hands of the proletarians and semi-proletarians”. As he said in May in battle at the conference of the party against the conciliatory trends in Moscow who dreamed of controlling the capitalists, “control without power is the most hollow of phrases” (8). In the correct Bolshevik tactics, workers’ control is inextricably linked with the seizure of power. Thereafter, unfortunately, this hollow phrase will be used ad nauseum by all those, “trotskyists” or others who want to avoid the thorny problem of the central seizure of power, preferring to substitute a harmless or impossible control... of the enterprise. How can the workers of Sidor control the production of their company, “to ensure that the priorities [of this steelmaker] support the people” as written by O.O.? It is not at the factory level that they can decide the priorities of social production, but at the central level, at the level of the political power of the State! Regardless of whether the State has 20% or 100% of the shares, regardless of whether the management is elected by the workers or imposed from above: as long as bourgeois state power has not been overthrown and the capitalist mode of production has not been eradicated, the enterprise can do nothing but obey the economic laws of capital, whatever its juridical status and whatever its ownership. We are not, as the spring of 1917 in Russia on the eve of the outbreak of the great revolutionary struggle, there is no “dual power” in Venezuela nor workers Soviets. As the economic crisis affects the country, in particular causing oil revenues to plummet, attacks against proletarians are being set in motion, the workers’ task is not to prepare the assault for power, but to prepare for the struggle in defence of their immediate interests. In January, the murder by police of 2 Mitsubishi workers who occupied the factory in protest against the dismissal of 135 workers, or threats of Chavez militarizing subway workers in case of a strike, show concretely what is meant by anti-working class repression (9): these are warnings for the future. Today, the vital need of workers in Sidor and other companies, nationalized or not, is not workers’ control over production, but control of their own struggle. This “control” begins with the break not only with the overtly Chavist currents, but also with fake revolutionary oppositions as a precondition for work towards the independent class organization of the proletariat from the strike committee and union to the class party. That is the true proletarian option, this is the only certain perspective for the proletarian vanguard and authentic revolutionaries! (2) “Nationalization of Sidor, a victory for the workers? Before or after its nationalization, Sidor will remain in the hands of the exploiters! ”, April 18, 2008. (4) This nationalization is not expropriation and the State assured itself control of the company by buying a 50% stake in SIDOR from the Argentine multinational Techint which will keep 10%. Negotiations on the payment of these actions are still not concluded at the time of writing, although at the end of January the Minister of Mining Industries again indicated that an agreement was near. The collapse of steel prices in the last 6 months is probably one of the causes of the difficulties of these discussions. (5) “El Universal”, 27/2/2009. After nationalization, the union abandoned its demand for reinstatement of outsourced workers and replaced it by that of the definition of a method of calculation of wages (tabulador) identical for all workers. (7) Article of P.O. published on 6 March 2008. (8) See in Volume 24 of Lenin’s Collected Works, the article “The tasks of the proletariat in our revolution” and his “Report to the Seventh Conference of the Party.” On the issue of “workers’ control” the reader can refer to a study published in Nos. 198, 199, 200 and 201 of “le Prolétaire”. (9) In a speech on January 30th Chavez attributed the murder to «mafias» that exist in the police. But he immediately added: «We must also appeal to the workers for good sense. Once in Guyana it so happened that they occupied a factory. This lasted for some time and they had guns. Why did the workers have firearms if they wanted to protest, to demonstrate and to threaten to sequester a minister? (...) I am not saying that this is what happened in the case of Anzoategui [area where the Mitsubishi factory is located], no. There was gunfire and we do not know as yet from where it came.» In short, it is the fault of the workers ... This murder is in addition to the killing of 3 union leaders in November after a strike in the State of Aragua, and many others.